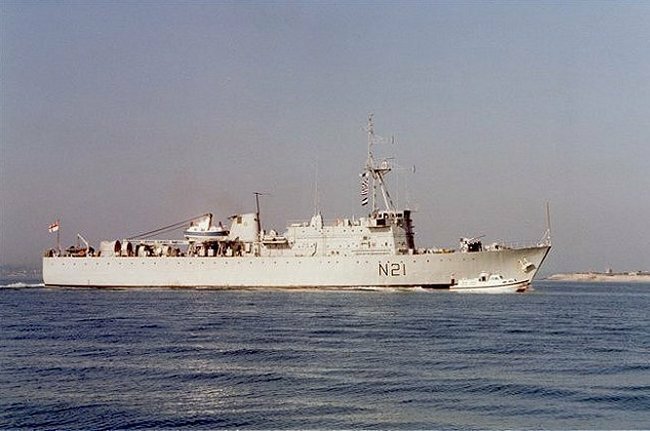 ISMAILIA TO PORT SUEZ | ISMAILIA TO PORT SUEZ 2 | ROGUES GALLERY | LIZARD LOUNGE | GEEZERS AT GIZA | TECHNICAL DETAILS | THE SUEZ CANAL TODAY | WHERE ARE THEY NOW.... | ADD A LINK TO YOUR WEBSITE..... | HMS SHEFFIELD - HOW COULD IT HAPPEN?? 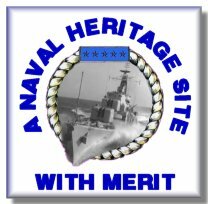 Support the call for an enquiry into the loss of HMS Sheffield - click on link below to go to HMS Sheffield page on this site!! The Suez Canal after the Arab-Israeli war. 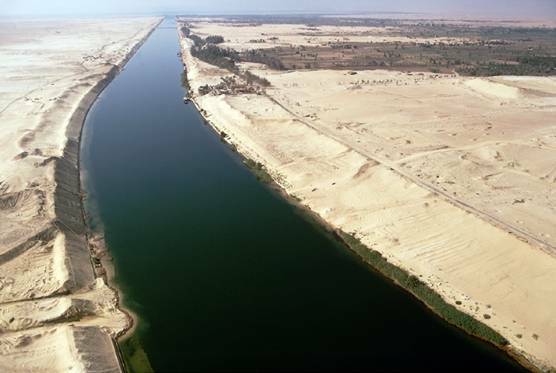 Clearly seen are the "berms" (sandbank fortifications) on the left hand side of canal which marked the Israeli defence lines (the "Bar-Lev" line) at the end of the 1973 Yom Kippur War. The breaches through them are the routes blown through by the Egyptian Army to allow tanks etc passage when they attacked the Bar-Lev line. They perhaps did`nt count on the Israelis counterattacking further down the canal at Deversoir, building a causeway across the canal and attacking them from the rear! 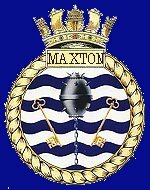 On 27th March 1974, HM Ships MAXTON and ABDIEL, after ammunitioning ship/storing at our base at HMS LOCHINVAR (Situated at Port Edgar, nr Edinburgh, Scotland) joined BOSSINGTON and WILTON at Gibraltar to make up the UK part of the International Task Force formed to clear the Suez Canal of explosive ordnance left after the Arab-Israeli war of 1973. 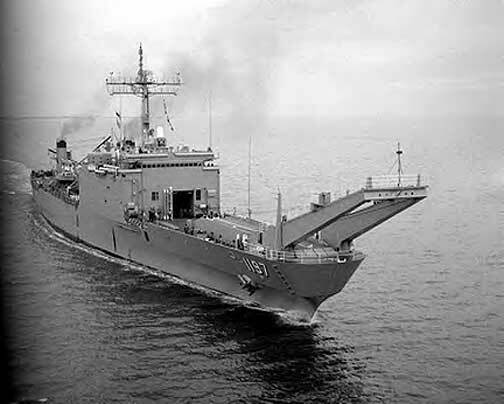 They formed Task Group 65.2 for what was named OPERATION RHEOSTAT (known as OPERATION NIMBUS MOON/STAR by US Forces). 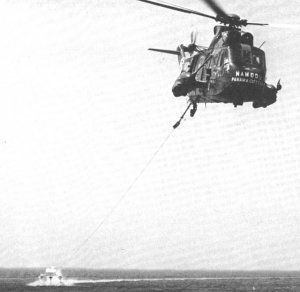 After a short stopover at Malta, the Task Group arrived off Port Said on 7th April 1974. On arrival, BOSSINGTON, WILTON and MAXTON hunted the approaches to Port Said to establish a swept channel for ABDIEL to join and enter Port Said. 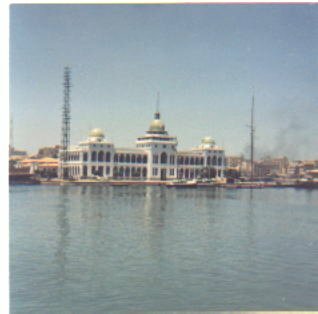 MAXTON was the first to enter Port Said, and ABDIEL entered and berthed alongside the Suez Canal Authority HQ Building, which was to be our support base for the first part of the operation. Minehunting continued in the approaches to Port Said and in the proposed anchorage area for the American LPH USS Iwo Jima, who arrived later and deployed their helos towing minehunting sledges to attempt to clear some of the approach areas.During the next few days, Port Said harbour and berths were hunted to clear any remaining ordnance and render the area safe. On 25th April, BOSSINGTON and MAXTON sailed from Port Said to Dhekelia (Cyprus) for a four day standoff. 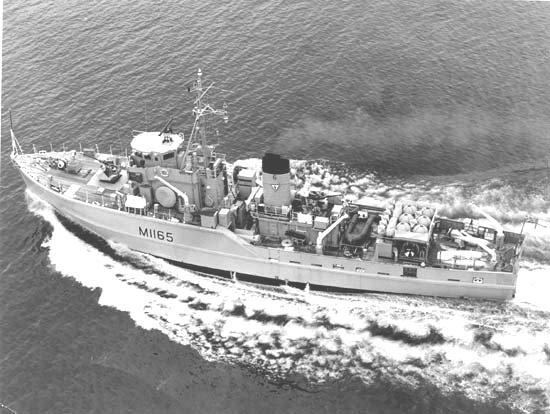 Dhekelia was not the most ideal location, the ships having to anchor offshore and run liberty boats, so it was decided to move the ships to Famagusta, to berth alongside the British Army RCT base. It was in Famagusta that most of us developed a taste for Keo Beer and the wicker flagons of Keo Brandy - some more than others! 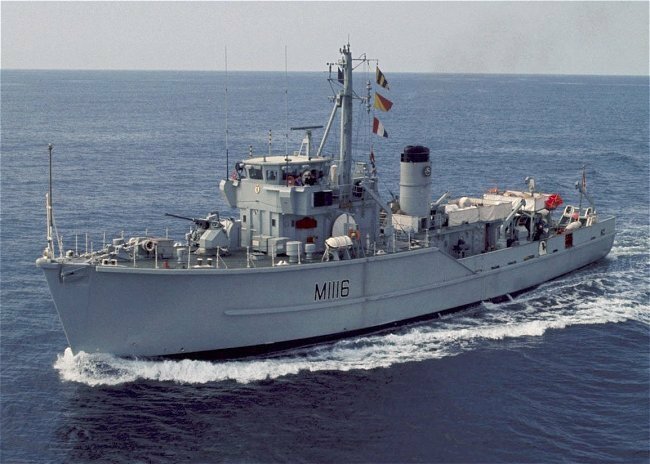 Both vessels returned to Port Said and commenced minehunting on the first section of the Canal proper on 29th April. 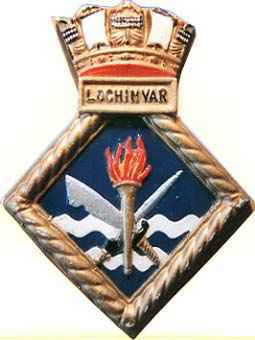 Hunting continued, working a 4 day on task/one day passage/one day standoff, usually alongside HMS Abdiel. Hunting lasted approx 12 hours per day, anchoring overnight in position ready to recommence in the morning. Items found included 2000Kg (and smaller) bombs, numerous anti tank rockets, unexploded shells, various other items such as AK47 personal weapons, grenades (in boxes! ), armoured vehicles etc. 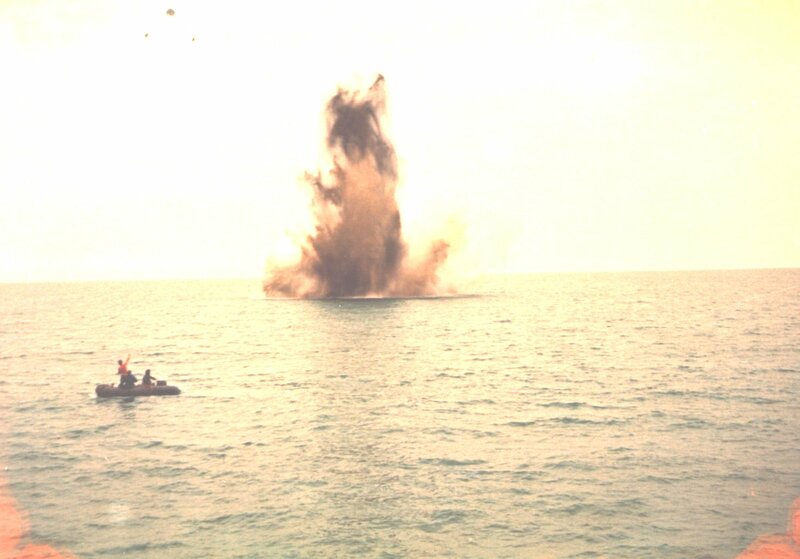 Minehunting continued until the canal was safe as far as Ismalia (Lake Timsah) when the Abdiel moved down to berth alongside a floating pontoon at Ismailia. Ismalia then became our operating/support base. Our partners in crime were the ABDIEL, WILTON and BOSSINGTON. ABDIEL was the flagship for our task group, the others were part of the hunting team with us. 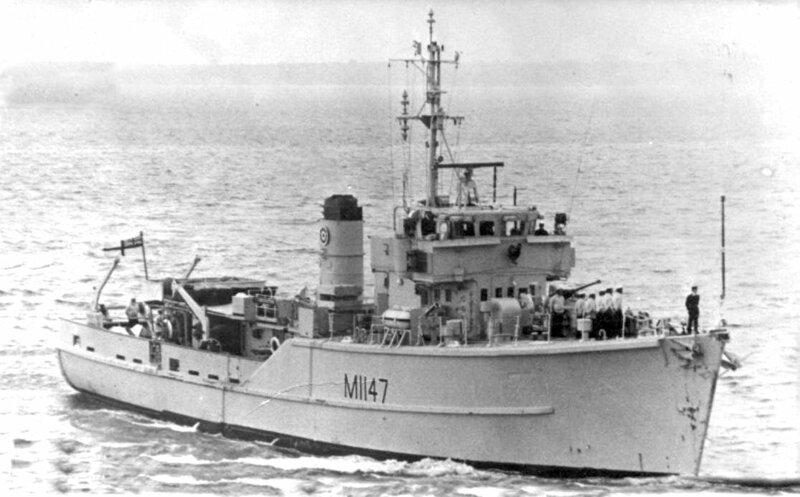 WILTON had the distinction of being the first GRP warship in service and was sometimes nicknamed HMS TUPPERWARE. "The lower deck bites back"